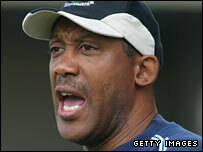 Keith Alexander has been appointed as manager of League Two strugglers Macclesfield Town until the end of the season, with a view to a longer deal. Previous boss Ian Brightwell has left the club after rejecting the chance to stay on as Alexander's number two. With 12 games left, the Silkmen sit one place above the relegation zone. "There are some good players here. We've got to turn things around as quick as we can and I shall try and do that," he told BBC Radio Manchester. "My time at Bury as the director of football wasn't as successful as I would have hoped but I'm back now as manager which is where I feel comfortable." Chairman Mike Rance added: "It is no secret that results of late haven't been what we have wanted. "With other sides picking up points around us, we felt a change was needed." Brightwell's assistant Asa Hartford has also left Moss Rose. Alexander had joined Bury as director of football in May 2007 to work with boss Chris Casper, but the pair were sacked in January. He had previously led Lincoln City to the League Two play-offs for four successive seasons before leaving the Imps in 2006. He then managed Peterborough between May 2006 and January 2007.